Yes. You read that title correctly. It does say “bunny” and “recipe” in the same sentence. But this isn’t a recipe for rabbit food. Bunny chow is actually a simple curry traditionally served in a scooped out loaf of bread and is a popular quick meal in South Africa. HOW DID BUNNY CHOW COME TO BE? 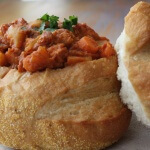 The stories of the origin of how it became known as “bunny chow” are varied, however, one I heard more than once was that of Indian merchants that used to sell this meal under a banyan, or ‘bania’ tree. It became known as “bania” chow, then eventually shortened to bunny chow. Just know that if you go to South Africa and a group invites you to grab some bunnies for lunch, never fear, they’re actually inviting you to taste this popular delicious Indian curry dish. 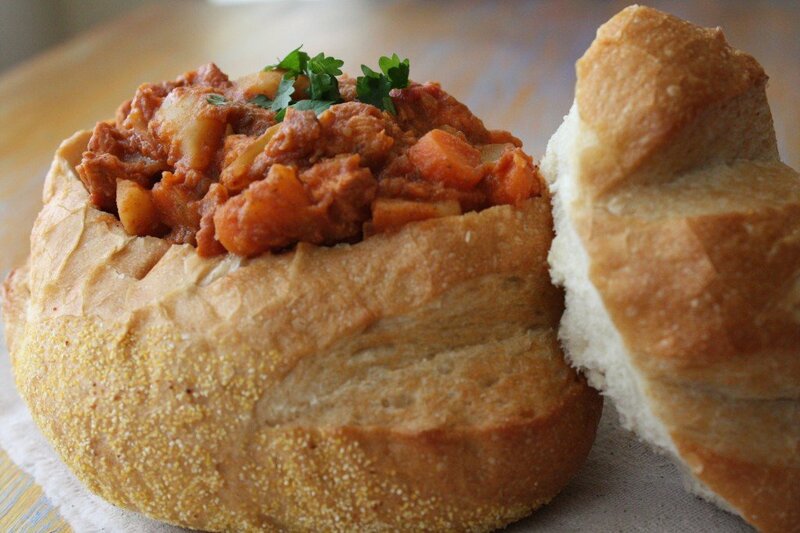 Bunny chow is a curry served in a scooped out loaf of bread and is a popular quick meal in South Africa. Indian curries are popular in South Africa, especially in the city of Durban where the Indian population is the largest outside of Asia and their cultural influence is definitely evident in the foods and spices. The Indian spice markets have been around in Durban since the late 1800’s and you can still experience the exotic scents at Victoria Street market where merchants have an array of seasonings piled in high pyramids and fragrant curry perfumes the air. As a foodie, it was one of my favorite shopping stops in South Africa. I was in HEAVEN smelling all the options. I picked up an ounce of saffron for the equivalent of $7 US dollars and one of the merchants at Madari & Sons helped me pick out my own “masala” spice mix that I used in this recipe below. The market is located in the middle of Durban on the corner of Victoria Street and Queen Street. If you go, I definitely recommend hiring a guide, such as Julnic Tours, to show you around. I’ve adapted this recipe from The Collection Cookbook, by Liz McGrath, given to me as a gift when I stayed at The Marine in Hermanus. Their version of this recipe features more Cape Malay seafood including mussels, calamari, prawns and line fish. I’ve swapped the seafood for chicken below to make this more suitable for the home cook. Take a peak at this video where I teach the host of Daytime TV how to make bunny chow! In a large saucepan, fry the onions until their almost translucent or clear. Then add all your spices and fry for another 1 to 2 minutes. Next add the tomatoes and mix in with the spices and onions. Cook until it forms a paste. Add chicken, potatoes, carrots, and water to the saucepan. Stir together with the tomato paste and bring to a low simmer. Cover and cook for about 30 minutes until the chicken is tender. Stir occasionally. Remove the bay leaves and cinnamon stick. Hollow out a loaf of bread and spoon the cooked curry inside the bread to serve. If desired, serve with a side of rice. Traditionally, it’s eaten with your hands and the bread is used to soak up the gravy. Enjoy! *If you can’t find garam masala at your local grocer or specialty spice market, it is just a mixture of curry spices you can mix at home to your own liking. The ingredients listed in my masala include: curry powder, ginger and garlic paste, cinnamon, cloves, cardamon, aniseed, cumin, corriander, tumeric, pepper, fennel, dill, basil, origanum, biryani mix, rosemary, thyme, mustart, pappadums, pickles, vanilla, bay leaves, poppy seeds, braaivleis spice. Bunny chow was the best food I had in South Africa. Two years later, and I still get cravings for it. Can’t wait to try this recipe! It’s actually pretty standard to eat it with a simple grated carrot and chopped onion salad. Maybe a few chopped chillies. All soaked in vinegar. Anyone coming to Durban, go to Gounden’s on Umbilo Road. Best bunnies ever. I drool just thinking about it! Thanks for the restaurant tip! I didn’t get a grated carrot salad with my bunny chow in Durban. We did have some awesome braai in one of the townships with a side of pop and a spicy carrot salsa-like sauce. It was delicious! Curious about BABUTI (sp? ), had a cook book with it in it and that is looooooooooong gone. Looks a bit smaller than the ones I remember more a 1/4 chow , Word ‘bunny’ I understood to be derived from a word ” baniya ” an indian word for trader and was originated in Durban by a street trader in 1940’s, the ‘chow’ is traditional South African slang for any food. Can have plain vegitables or beef or lamb or goat as well as the chicken as in the recipe above. I remember them best as a student, after a good night out or an early surf going to a takeaway for a good spicey bunny chow to end the evening, could get iether 1/4 loaf or 1/2 or full size or a large ‘vet-koek’ split and filled with the ‘curry’. I am stealing this recipe for my blog on Thursday, I hope that is OK with you. Please don’t ‘steal’ any recipes. If you’d like to make it at home and post your own photos, please feel free! Glad you find the recipe appetizing. I studied abroad in South Africa, so this looks great! How many people does this recipe serve? I don’t want to skimp when I make it for friends! Hi…im living in the uk now an would like to know how I can get my hands on some durban curry masala..im desperate..